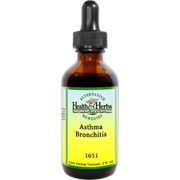 For asthma, bronchitis, pneumonia, and other bronchial conditions where extra fluid is in the lungs. Elderberry, Pleurisy, White Pine Bark, Wild Cherry Bark, Horehound, Peach Bark, Peach Leaves, Elecampane, Marshmallow, Slippery Elm, R/O Water, 12% Alcohol. Asthma & Bronchitis #1 is shipped in a discrete, unmarked package. Orders are processed immediately and usually take about 3 to 5 working days to be received. Any information received is used only for order processing and shipping purposes. Your information, such as e-mail address, will never be disclosed to a third party.